For most of my childhood, we drove thirty minutes to a church down, down, down the winding road. My life was split in the middle back then - there was the place where we lived, and there was the place where we had church. The two halves didn't come close to intersecting. Adults around me talked about being "fed", interesting now because our church body never shared a table, and though I'm sure I must be wrong, I don't recall ever swallowing the bread or drinking the cup. The body of Christ was never broken for me, but His church was the shell of a cicada, a fragile representation of the life it might embody, full of holes yet somehow keeping its shape. We wanted meat, that's what I was told. No milk for us, please. When it came to the ways of the Spirit, we were chest-pounding, steak-searing, fork-and-knife people. And my baby teeth were sore. 2012, our first full year in our new community, stunned me with its easy way. I expected turmoil. Whiplash. I geared up to be broken and bent, assuming the church at the end of our street was one of the most obvious tools in our spiritual dismantling. We'd have to change our lens if we wanted to see things clearly. It would cost us. But that's not what happened, at least not at first. Our souls found their fit among simplicity and our hearts were home in the broken place of the ordinary body. We recognized our thirst for milk. Year two was more of the same. Year three nearly broke us. We wrestled our will against the temptation to want what we wanted, to decide what was best. Day after day, week after week, we entered the ring, willing God to wind us back to the way it was before, when the change was all for us and following His hand was the obvious choice. As it turned out, we liked our bones rattling from the shock-waves of excavation. Being broken had become the only way to feel whole, and doing everything differently was the only thing that felt normal. I can't say what shot us back to a place of confusion and discontent, but I know it wasn't God. The pews emptied, the cobbled-together church choir thinned. People became unhappy to the point of walking out the door without a glance back at the worn-smooth altar. We begged to go with them. We worried for our children. We wanted to be fed. When I was a child, the bright spot of my church experience was watching the youth pastor's wife on stage with her mall-bought dress and her wireless mic. All of her teeth showed when she smiled, twin strands of pearls stretching back to her molars. I practiced in the mirror, and though I didn't have it mastered, I hoped it was something I'd grow into. Choir robes were for light-weights, back then, and don't even mention a pastor in a robe. The pastors I knew wore silk neckties and drove Caddies waxed by lesser men. Their faces were tanned, their words a flurry. They spoke in the tongues of men and angels, banged tambourines, and palmed foreheads into submission. They swore they loved. For the most part, I believed them. Sunday church was an hours-long series of promises made on God's behalf. Their faith could fix the middle class kid who robbed the convenience store and landed in jail. It could fix the druggie with red-rimmed eyes, and set life into barren wombs. It could quench red-hot lust and pull the devil out of a teenager like long strands of ribbon from a Black Sabbath cassette tape. It could. It would. It will. He can fix you if you believe. Their words never turned on themselves, not so far as I could see. They were wax. We all were wax. But I was a child, and I already understood my own capacity to melt. Don't tell me who you were unless you're quick to follow it with who you are right now. Please don't make me believe my dead cousin might knock on the door any day as long as I don't ruin it with my doubt. Don't convince me this life right here should be my goal, or that Heaven is only home to the whole. I didn't want a faith that could move mountains. I wanted a faith that could ride out a howling stretch of pain and keep its spark through the low winds of drought. A few months ago, a man went to work in our sanctuary, yanking up a front-row pew by its screws. In its place now sits a table, kid-height. There are things to consider when it comes to church, along the lines of calendars and logistics and what exactly do you do when there's no one left to teach children's church? Our stale theology of convenience-store church has us wringing our hands and biting our nails until they bleed. Where will we put the kids? Who will lead them? Will it be good enough? Will it meet our standards? Will it make them whole? As it turns out, desperate people can be shockingly resourceful. Just ask the women over at the county jail who make their own tampons and cook a holiday feast on a laid-open chip bag as a hot plate. In the case of our church, we needed to McGyver a viable option for the 5-10 kids who show up on Sundays. Our pastor decided to keep them in with us. It struck Cory and I as brilliant. God whispers between the groaning planks that form us into His family. His wisdom floats on the dust mites filtering through the light-soaked stained glass window at our backs. My ways are not your ways, Shannan. You don't know the half of it. This isn't about you. Or even your kids. They're squirrely. A smidge too loud. It's distracting, and makes some folks grumble. Once, Ruby climbed under the table and sat there for a full minute making silly faces, to the delight of her brother and friends. They play with sticker books, and they aren't even religious stickers. "This is a multi-generational church, and we have much to learn from each other." That's what our pastor said. "We send them out for their entire childhood then wonder why they don't believe there's a place for them as they get older." The truth of her words stunned me with their clarity. One Sunday, one of the moms unfurled a roll of white paper across the table top and dumped out a box of crayons. After the service, I gathered up stray pictures half-heartedly colored and cast aside. 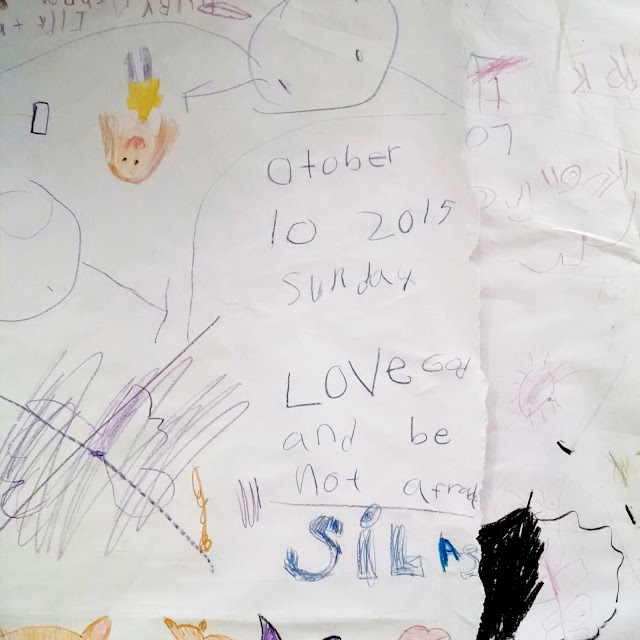 This caught my eye, sermon notes penned by the wiggliest kid among them. Jesus is dying to set a place for us, so He gives us the insider-scoop on how to make it happen. Among His key pieces of advice: you must have faith as a child. Our kids don't have big opinions on doctrine or procedure. They're malleable and unfancy. Teachable. Committed to living the simple. The Holy Spirit is alive and rowdy among them at His table. What if God is bigger than we think? What if He supersedes our common sense that doesn't extend past the last row of congregants? God keeps using my church, my community, the school at the end of the block, to redeem in me His kingdom here on earth. It's not because all the boxes on my wish list are checked, but precisely because they are not. The work right now isn't as easy as it once was. We are not done wrestling and it feels at times like we've been forgotten. I want it easy again. I crave lightness and, if given the choice, I would always sway away from tension. I simply do not know what the future looks like. But my prayer is that I continue to make the hard turn from insisting on my own way, to believing in my guts that I know almost nothing about what I need. I want to keep being proven wrong, and to test my faith not against how many of my wishes God grants or how closely He tethers me to what's familiar, but how ready I am to bend. The health of my soul depends on my willingness to veer haphazardly away from what's reasonable and instead try my best to view life with the lens of what I can offer, not what I can consume. I am a child of God. A child. I want to get better at acting like one. Shannon. Girl. Incredible post. Thanks for taking time to wrestle your thoughts down so we can all learn and grow and nod our head YES! Every single line resonates with me. Whoa. Kelli, your encouragement means so much to me! I'm so glad we're pals. When our son was born I knew we were lucky to have moved to our parish town. It actually has a designated Children's Mass every Sunday at 10am. The children are never separated from the mass. It is for them just as much as it is for us. We are lucky to have one of the most wonderful priests who was truly born to work with the young. As a matter of fact, he calls up all of the children to the alter twice during each mass. I probably don't need to mention that every single Sunday, the 10am mass is full to standing room only. And I'm not even talking about the Teen mass offered every Sunday at 6pm. It astounds me. This is the Roman Catholic Church. Everyone is included. I have always thought it strange when one of our Protestant friends mentions that Sunday School is during their church service. It has never made sense to me. I sounds like something is missing there. I actually didn't know that some churches send the kids out until recently. Our congregation has them with us too and even though it can get a bit loud, I absolutely cannot picture worshipping without them. Hard things are often worth the greater price, I so agree. I just love this. Like a CHILD. ! What a way to see the world...God...even ourselves. I miss this part of church. It's a great thing your pastor has done. There used a five minute children's sermon where all the kids piled up to the front at our church. It was the best part of the service to hear what those kids had to say when asked questions. When it became the norm to herd them all out to children's church, the dynamic of the whole service lost something. I regret that our children did not go to church with us. Their kids program was such a fun place to be that my husband thought if that is where they want to be, let them go. It bothers me that they did not see us worshiping, giving, etc. I am 100% fascinated by this post! I grew up in a small town with several small churches. 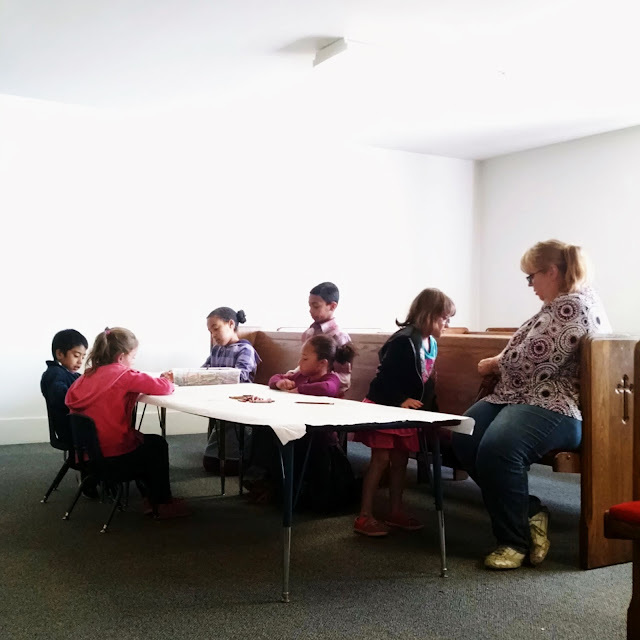 Regardless of the denomination (if there was one) all the kids where always in the church during the sermons. Even the babies. Even when they screamed or just laughed at their grandpa two rows up. There were separate rooms, for Sunday classes or the kitchen, etc, where a child might be taken if needed but they went and then came back with their parents. I had frequent nosebleeds and was well aquainted with a brief disappearance. We set in the pews and if we were small we might color or hold a doll or a toy truck. But we were always there. Hearing everything the parents heard. I go to a bigger church in a bigger city but it is the same with the kids. They are present and expected to listen and participate in the same ways the adults do. I did not realize it was not always like this. There are so many things that kids gain from that experience. Too many to go into in a comment that has already gone too long. But your family is so blessed to have this experience. Their minds and souls will be so much the richer! Hallelujah for your little church! I don't know if I've ever commented here, but I had to after reading this. Thank you, Shannan. You've articulated here so many of my own church experiences and my own longing for my kids in a church of our own. We just moved to Australia and are looking for one, I'm wearied by the slick kids program approach that most churches seem to be embracing these days. Let's see what happens, it is lovely to know that there are others who work through these things as well.